This week’s activities have been varied, however my overwhelming reflections are positive. It felt like I was making a real difference to as many people’s lives as I could. It got me thinking about how we can ‘add value’ to others with our actions and choices in life. Anyone who knows me well knows that I value being a decent, kind, caring and compassionate human being highly. In fact, I’ve made it my life’s work to live these values daily. For me talk is cheap, it’s how you live your life that really matters. Don’t tell me how to be kind, show me! 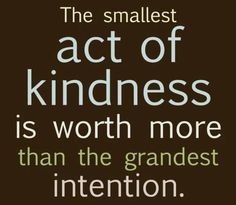 Being kind has much more of an impact. Think of it as your ‘kindness footprint’. ‘Make mine a large one’ is all I’ll say on this. While I’m ambitious, hardworking and always striving for excellence, I will not compromise my ideals to achieve success. The ends certainly do not justify the means for me. My conscience must be clear. I have to live with myself at the end of the day and I want to always have a good night’s sleep. I hasten to add that there have been quite a few people over the years who have disagreed with me and have blatantly advised me to be ruthless and to ‘learn to blag’. My counter argument is that I should not need to blag if I’m knowledgeable and confident. As for being ruthless, all I say is NEVER! This tweet captures how I feel and I know that I’m not alone in living kindly. There are millions of kind-hearted people out there. Let’s all stick together to show that living kindly adds joy to your own life too. Have a positively inspiring week! I leave you to reflect on how you can be a bridge over troubled waters for others. What will you do? How will you show kindness? Share it with me.